WINDMILL TRACTOR RUN: Chailey Classic and Vintage Tractor Club had a great turn out of numerous tractors of all ages for the Club’s first run of the year last month. It commenced at Chailey Windmill on North Common and travelled on to the famous Jack and Jill Windmills at Clayton via the Oldland Windmill at Keymer. Club Mascot, Windy Miller himself, made a special guest appearance to the delight of children and adults alike. Upon arrival, hot tea, coffee and chicken stew was kindly provided by Mr ‘T’ of Fletching Village Stores and all involved were privileged to be shown the intricate inner-workings of ‘Jill’ by members of the Windmill’s Preservation Society. Chailey Tractor Club is a group of enthusiasts who have a passion for vintage tractors and agricultural bygones. They enjoy keeping them “alive” and maintaining the heritage of classic agricultural machinery whilst in the process promoting and collecting for the Club’s nominated charity St Peter and St James Hospice. Pictures of the day are available on Facebook or on the Club’s website (http://www.chaileytractorclub.org). New members are most welcome, to find out more email chaileytractorclub@gmail.com or telephone 07971 792449. MUM & TODDLER GROUP: at St Peter’s Church on Chailey Green, takes place every Friday from 9.30am. This is free of charge and coffee, tea and biscuits will be available. If you or anyone you know would be interested in coming along please contact the Parish Office on 01825 722286 for more details. FIND OUT MORE: Days you are invited to find out about what volunteering in the various departments at the Bluebell Railway. The next day is this Sunday (April 8) from 10.30am at Sheffield Park Station, and ending around 4.30pm. The day includes a tour behind the scenes to show the variety of roles and departments that you can volunteer for. For more information, email Volunteer Recruitment Leader David Chappell at Volunteering@bluebell-railway.co.uk or call 01825 720800. PLANNING COMMITTEE: All Chailey residents are invited to attend the meeting of the Parish Council’s Planning Committee at 7.30 pm on Tuesday, April 10, at The Reading Room, Chailey Green. The Committee will be considering current planning applications and the Council’s response to them. Members of the public will have an opportunity to speak about any planning or related matter. The full agenda can be found on the Council’s website at chailey.org. They look forward to seeing you. LUNCH CLUB: at St Peter’s Church is held monthly at 12.30pm in the church, on Chailey Green, and the next lunch club is on Thursday April 19. All are welcome to go along for a delicious meal, meet new people and chat and relax. The food is freshly prepared and home-cooked with a main course, choice of puddings and tea/coffee all for £5 per person. There is easy access and disabled toilet facilities. If you require transport or further information please contact Julia Guerard on 01825 722967. ST GEORGE’S DAY FETE: organised by Chailey Bonfire Society in the field at Markstakes Corner, South Chailey, takes place on Saturday April 21. It takes a lot of people to put on a successful event, if you feel that you could offer your services to assist the Bonfire Society and would like to know more please contact Diane on 01273 401900 or via email at secretary@chaileybonfire.co.uk. The Bonfire Society invites you to have a stall. The fete will be open to the public from 12pm to 4pm. Each pitch is suitable for a gazebo and larger pitches are available. Car boots and general stalls cost £10 and charity stalls £5, with parking available behind each pitch. Payment to be made in advance. If you would like more information call Yasmin on 07376071248 or email yasmin.black93@gmail.com. ASTRONOMY IN THE PUB: The 6th Chailey Astronomy in the Pub takes place on Saturday April 21 from 5pm to 12pm. Do go along for a night under the stars at the Five Bells in Chailey. Learn about the wonders of the universe and how to view them. If clear, there will be telescopes aimed at objects for you to view, along with a team of amateur and professional astronomers to answer your questions. Entry is free, so why not join them. For more information call Richie Jarvis on 07702 705427 or email richie@nebul.ae. PARISH COUNCIL MEETING: All Chailey residents are invited to attend the meeting of the Parish Council at 7.30 pm on Tuesday April 24 at The Reading Room, Chailey Green. The Council will be considering and making decisions on a range of matters relevant to Chailey and its residents. Members of the public will have an opportunity to speak on any issue they wish to raise or draw to the Council’s attention. The full agenda can be found on the Council’s website at chailey.org. They look forward to seeing you. TOY AND RAIL COLLECTORS’ FAIR: is at the Bluebell Railway, Horsted Keynes Station, on Sunday April 28 from 10am to 4pm. There will be model railways (new and second-hand), die-cast, collectables, railway books, Railwayana, photographs and preservation societies. Admission is by platform ticket or free with train travel ticket or Bluebell membership card. WINDMILL AND RURAL LIFE MUSEUM: will open for the first time this year on Sunday April 29 from 3pm to 5pm. Admission costs £1 adults and 50p for children aged 10-16 years. For more details call John Smith on 01825 723519. WOMEN’S INSTITUTE: meet on Tuesday May 1, at the village hall, at 7.45pm to discuss the 2018 Annual Meeting Resolution. The resolution to go forward to the final vote at the Annual Meeting in Cardiff on June 6 is ‘Mental health matters as much as physical health. The NFWI urges all WI members to recognise the importance of parity between mental health and physical health, and take action to make it as acceptable to talk about mental health issues as much as physical health issues, and to lobby government for better support for mental illness’. WI members will have the opportunity to learn more about this issue and decide how they wish their delegate to vote at the Annual Meeting, i.e. for or against the resolution. This promises to be an interesting discussion and new or prospective members and guests are most welcome for a nominal donation of £3, which includes homemade refreshments. To find out more call Margaret Smith on 01825 723519. HOLIDAY MILLENNIUM WALK: The annual Chailey Link Walk takes place on Monday May 7 starting at 10am from the Pavilion at the Sports Ground, North Chailey. 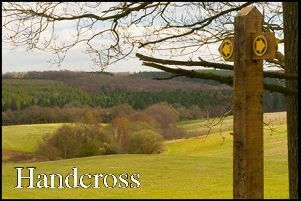 The walk covers 6.5 miles (although there is a ‘short cut’ reducing it to 4 miles) and goes across Memorial and Pound Commons, through ancient woodland and bluebell woods with splendid views of the Downs, St Peter’s Church and surrounding farmland. At the end there will be a barbeque for those who have completed the walk. Maps with full instructions will be available at the start. If you have never done the walk before, or are new to Chailey, do come along and enjoy meeting new and old friends whilst getting some exercise, listening to the birdsong and admiring the bluebells. For more details call John Smith on 01825 723519 or Trevor Smith on 01273 891008.